On Mar. 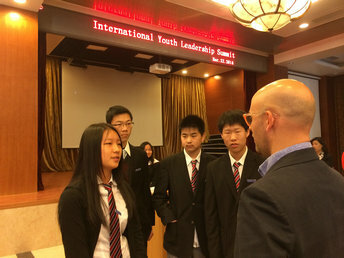 22nd, 2014, our school attended the International Youth Leadership Summit held by Experimental High School Attached to Beijing Normal University. Besides us, several good high school in Calgary, No.4 high school, No.11 high school, No.55 high school etc. This meeting was held in Yifu building of Experimental High School affiliated to Beijing Normal University. 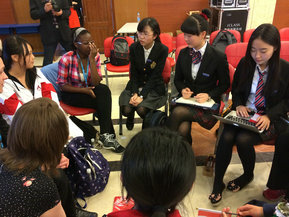 At 9:00, the meeting began with a small piece of traditional Chinese music played by students. Then, the leader of Experimental High School a to Beijing Normal University gave us welcome words. After that, all of us were taken a photo. Afterwards, Mr. Tomer Rothschild who is from Co-Founder of ESC, China gave us a wonderful speech. His topic is about Making Educational Choices in Pursuing an International Career with Meaning. He shared his unique experience with us. After that, another speech is from Mr. Daniel Cheng, who is a Canada-Chinese. His topic is Being a global citizen, the identity, challenges, strength and responsibility. The most significant part of this meeting began that afternoon. All of the students were separated into 6 groups, every group has a topic. Group members needed to discuss about this topic, made a PowerPoint, and then prepared to present it. All of our school’s students showed active in every group’s presentation. They really did a good job. The summit also gave students a very good experience. They became aware of those role models they should emulate. Everybody in this meeting can speak such fluent English. Another highlight is the difference between Chinese and Canadian. Chinese are often lacking in confidence, and are shy to express their views. 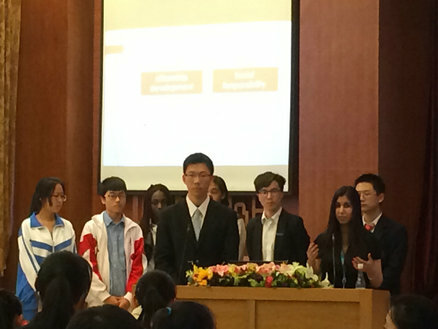 Confidence and public speaking skills are what the Chinese students should work on.